I have updated my 2018 Calls. To remind you, the point of this account is to employ the capital to create income using covered calls. This strategy varies from my dividend machine strategy. My dividend machine stocks have to pay a dividend that is greater than the 10 year U.S. Treasury (2.75%.) I also use other criteria to pick those stocks. My call portfolio is designed to create income through short term calls. So far the shortest term call I sold was 4 days on Twitter, symbol TWTR. The longest duration call so far is a call I sold on Apple, symbol AAPL. 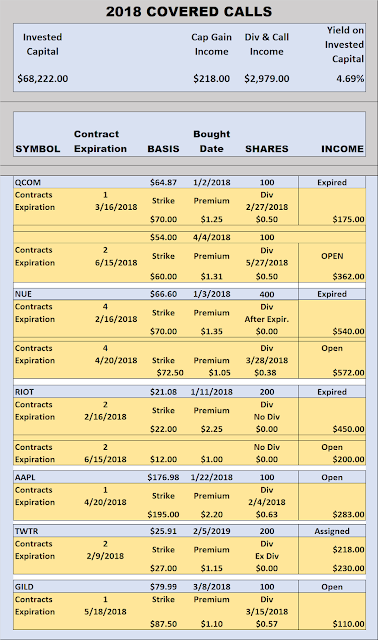 I bought AAPL on January 22 and sold a call with a duration of April 20 or 88 days. My strike price is $195. With AAPL trading at about $176 right about where I bought this lot, I think I will be selling more calls on AAPL once this call expires. Although the overall market is down again today, a number of calls are enticing. Only one applies to my call portfolio and that is Qualcomm, symbol, QCOM. 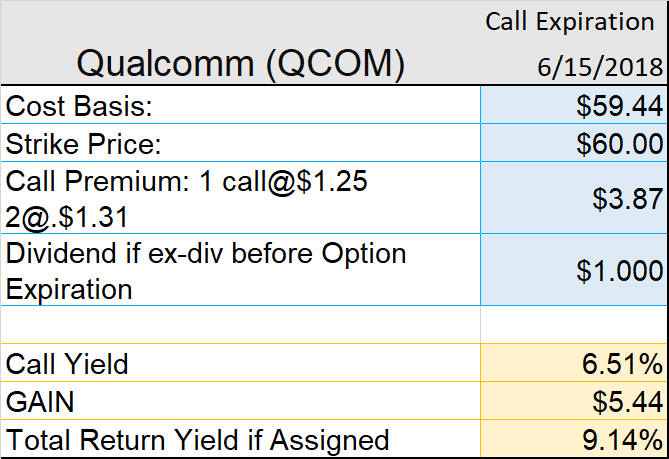 I am taking a risk on a Qualcomm by selling a call with a strike price that is below my basis. I have already sold one call on QCOM that expired. My basis on that call was $64.87. QCOM has corrected by over 16% to $54.00 I added 100 shares today at $54.00 which will bring down my basis to just under $60.00. That makes the strike price of $60.00 more palatable. I sold two June 15, 2018 $60 call for $1.31 today. If I retain ownership of these shares, I should also receive the dividend before the call expires. 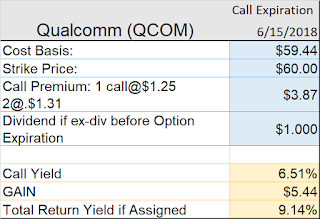 I don't particularly like this new call but I am willing to lose my QCOM and move it into another stock with more calls. I will be nervous until this call expires or is assigned. If these calls on QCOM are exercised here is my return adjusted for my new cost basis and including both dividends and the call premiums. One of the interesting sides to publishing my ideas, is I have to face the music when I am wrong or my strategy does not work. Honest reporting here. The table below represents all trades made in the 2018 covered call portfolio. Overall I have a positive view of the economy but I know external influence will keep the market volatile. Depending on when the volatility affects stock prices will determine how well I do on these trades.